Haioreum's Asian Style Noodles - Bonito, or Hanil Food's Deuchi Udon. Went to a local Asian supermarket to see if they had any instant noodles on sale. Haioreum Asian Style Noodles was one of the only ones available, so I picked up the bonito flavored one. This is a bowl noodle that has very attractive packaging. And the noodles look big! 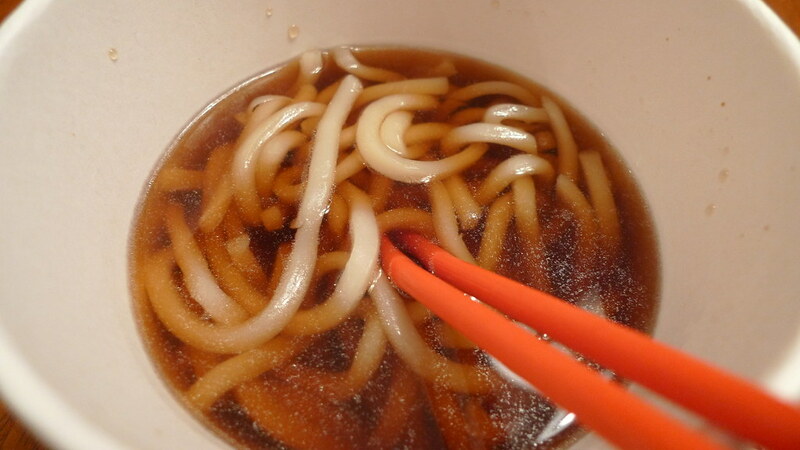 Oh, they are udon. But should you judge a noodle by its cover? And what exactly is "bonito"? Find out after the jump. Kind of nervous about this one! Never had bonito flavor before. 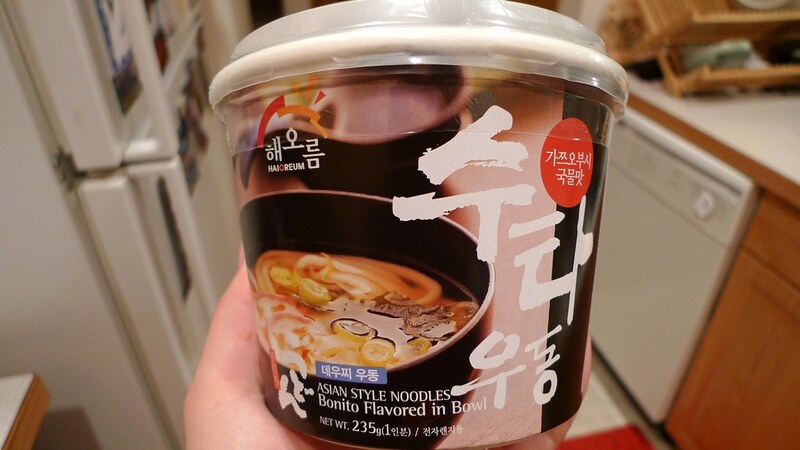 Before we continue, I've been having trouble finding the exact name of this since the packaging just has Korean Hangul on it, but I think I have figured it out. 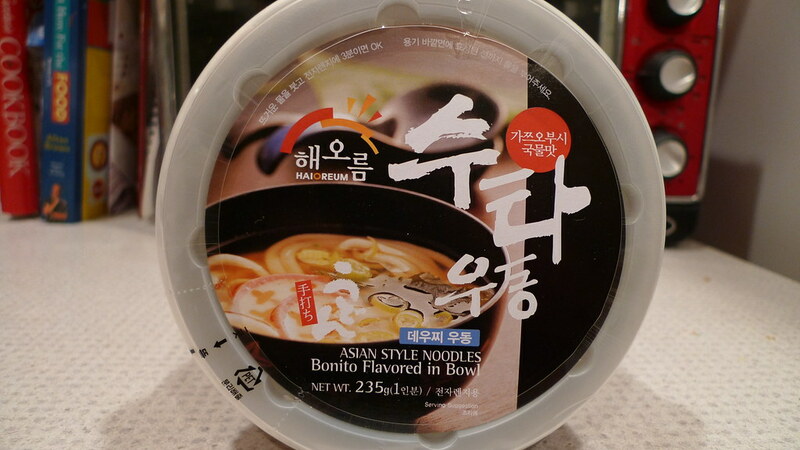 On my search, I found another Korean brand that makes the exact same thing, but in a differently designed bowl. Hanil Food Co., Ltd. makes "Bowl Udon (Bonito Flavor)", or as they write on the bowl "Deuchi Udon" which I believe is their version of saying "dashi udon" (I'll explain what "dashi" is in a moment). The shape of the bowl, the cooking instructions, and the packets inside are all the same, so I suspect these are identical. The only thing that doesn't match is the net weight, but it's not a major difference. My guess is that Haioreum is the name of Hanil Food in America, though I have no idea why they would make such a confusing change. Especially since both mostly have Hangul on them. 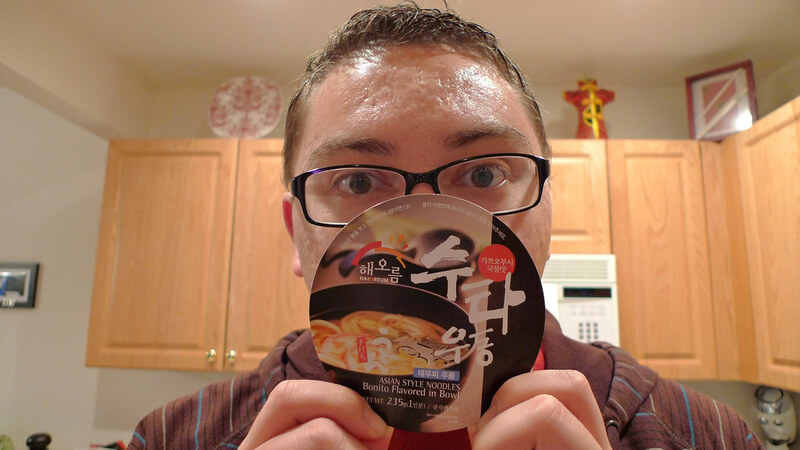 I also could not find any other noodle or ramen blogs that have reviewed this. All the stuff that comes in the bowl. Noodles, soup mix, and dried veggies. Still, even if they are completely different brands, I'm sure their objective is the same. Quick bonito flavored udon noodles. If you're like me, then you don't know what "bonito" flavoring is. I bought this without researching the exact flavor first, and to be honest, I probably wouldn't have purchased it had I known what it was. Well, bonito is a name given to various species of medium-sized in the mackerel family, including the common Atlantic bonito and Pacific bonito. More generally, bonito can refer to various scombroid fishes related to but smaller than tuna. In Japanese cuisine outside Japan, bonito usually refers to the skipjack tuna. This fish is smoked and dried to make katsuobushi, an important ingredient in making dashi, which is Japanese fish stock. And that's the soup in the item I am reviewing here. Dropping in the noodles and liquid soup before adding the hot water. These noodles come in a large paper bowl with a nice lid. However, you won't be using the lid because the udon noodles come in a separate plastic package where they stay fresh in a moist environment. Sort of the same way the noodles in Simply Asia or Myojo are preserved. 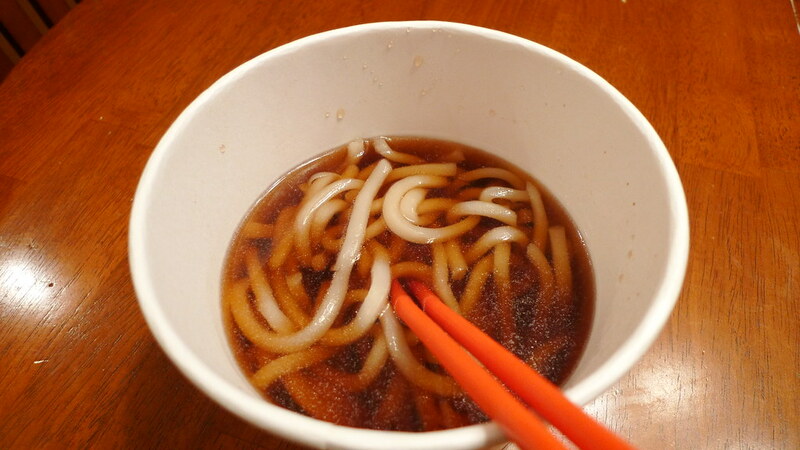 The wet udon noodles are also the reason that there is only microwaveable directions. 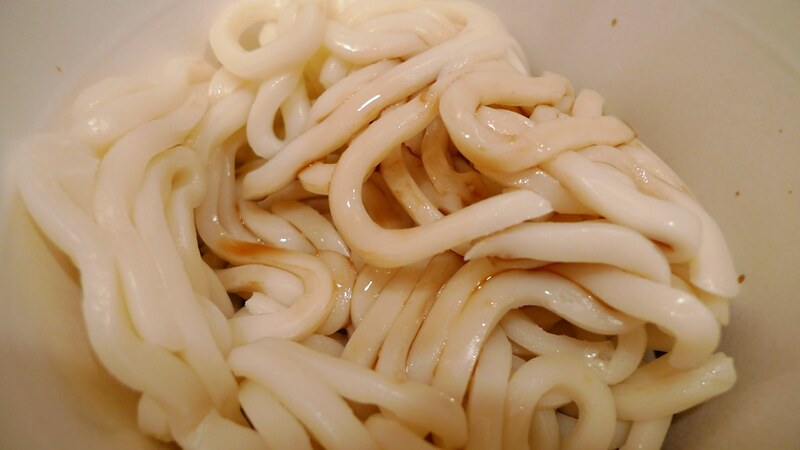 The noodles themselves are your typical thick udon. They are very square shaped and chewy. They are also a little more translucent than Myojo's Udon noodles are. They do not soak up the broth very well. 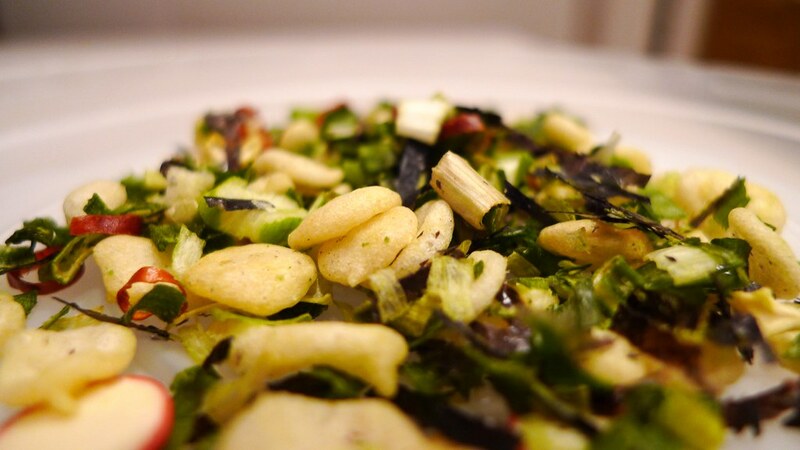 A look at the mixture of dried vegetables and fish cake. The broth is not as bad as I thought it was going to be. I was expecting this intense fishy smell and taste, but it's truly not that pungent. It still wasn't a desirable flavor. Actually, the flavor also wasn't very strong. The broth is added as a wet mix instead of a dried one like most instant noodles. 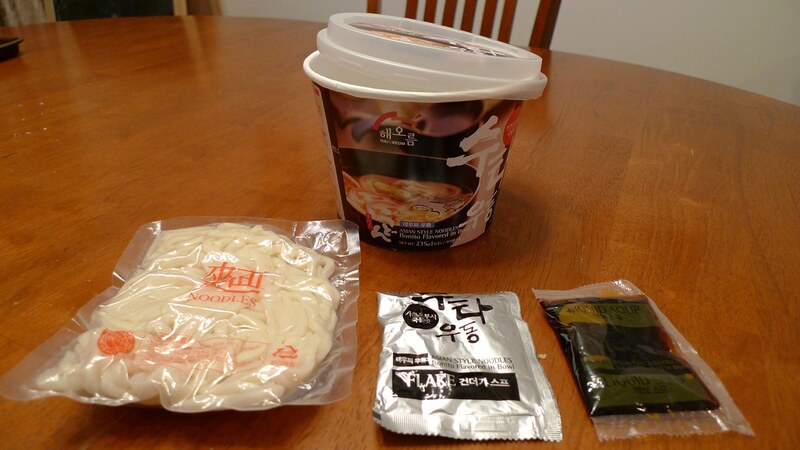 You also get a dried vegetables packet that contains green onion, dried fish cake, seaweed, and hot pepper. As far as things you can add goes, pretty much any form of seafood would work. Also, mushrooms. Bonito udon ready to eat. In the end, I'm glad I brought my expectations down for Haioreum's bonito noodles. It's definitely not inedible, but I wouldn't purchase it on my own again. For those who enjoy a light fishy or seafood taste, this would be a good one for you. Juliana liked it quite a bit. She even had a second helping. This one is just not for me.